Up until now I have used modern dyes to dye my leather, colour-matched to produce an authentic range of colours, but I wanted to experiment with authentic dyes to see how easy they are to make and use. I therefore did some digging around and found references to the processes for making black and brown dyes. These are the most common colours we see in illustrations, painting and manuscripts. I’ve established that to get a red dye they used kermes, but this is hideously expensive and I don’t have any other information about the process, so that’s on hold at the moment. Walnut shells are well known as a wood dye and I found references to leather dyed with them dating back to the 1300s. The crushed, roasted shells are soaked in water, giving a dark brown solution. The dye can then be rubbed into the surface of the leather. Two sections of the purse above are dyed brown: the front pouches and the inner lining. Although different shades, both were dyed with the walnut dye. The main difference between the two shades is the number of times the dye was applied: more applications gives a deeper colour. These shoes were also authentically dyed, but they were then soaked in water so that they would stretch around the owner’s feet. The walnut dye is not as colour-fast as modern dyes and a good deal of the colour leached out in water. After oiling they did not lose any further colour, despite going through plenty of puddles when in use. Black leather seems to have become increasingly common in the later Middle Ages, based on visual evidence from paintings (the Renaissance in art is well established by this point, so they are aiming to produce life-like colours). It is most common on pouches, belts and dagger scabbards, potentially for decorative effect. It seems to be rare on shoes, possibly because they wore out too quickly to be worth it (see below). To dye leather black, you need acid, iron, and a tannin, just as you do when creating black ink. The leather has already got tannin in it from the tanning process and simply dyeing in an iron pot would provide the iron, just as dyeing weld in an iron pot produces green instead of yellow. The purpose of the acid is effectively to rust the iron, however, so rather than damage a pot I soaked iron wire in a vinegar solution in a glass dish, and then submerged the leather in it. The impact on the leather was rapid: within an hour it was already turning a blue-grey. It dyed best when floating just below the surface of the water, presumably because it was more exposed to the air. Where layers of leather overlapped, the lower layer didn’t dye as well. I took it out after two weeks as if you leave it in too long, the acid will eat away at the leather, causing it to decay. At this point it was a deep blue-black which, after oiling, came up as the intense black shown below. Unlike with a modern dye, iron and vinegar turned the leather black right through, rather than just the surface. 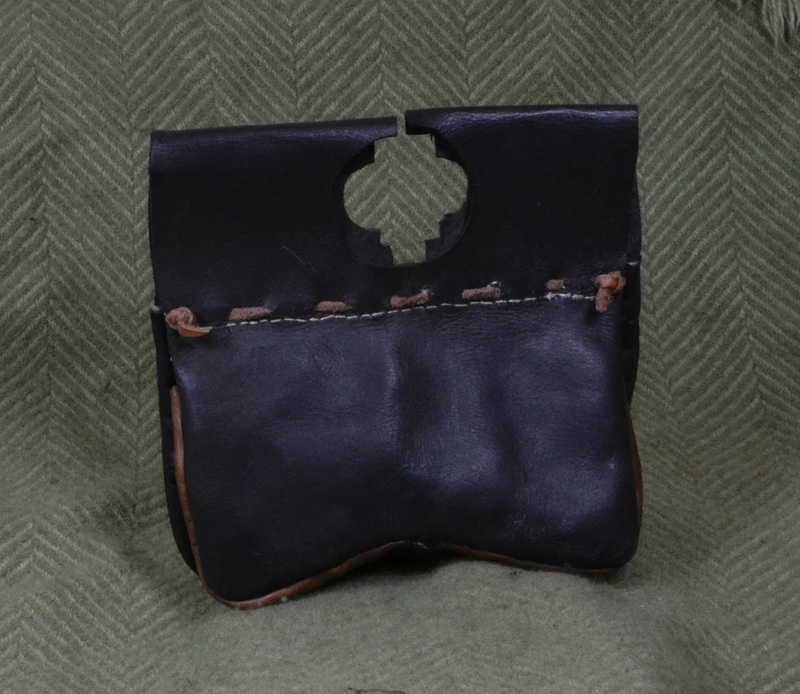 Rear of girdle pouch, showing black dye. I mentioned above that it may not have been worth dyeing shoes black because they wore out too quickly. As it took two weeks to get a deep black, black leather would have been very expensive and therefore not worth using on a comparatively short-lived item such as shoes. I only make shoes to order, so your shoes will be fitted exactly to your feet. This means they may not both be exactly the same shape! I also make them so that they fit snuggly. Leather is an immensely malleable material which can stretch by up to 20% as it as used. If I made them to fit loosely the way modern shoes do, then the inherent stretch means they would be falling off your feet after a season. If you would like to stretch your shoes before wearing them to a show, then just put them on, damp them, and walk around in them for a few hours. You can add waterproofing by applying a mixture of beeswax and oil (or modern equivalent) to the uppers and letting it soak in. Don’t coat the sole: it will make them very slippery! You should do this roughly once a year to feed the leather and keep it supple. If making up your own mixture, avoid walnut, almond, linseed or Danish oil as these will dry your shoes out. Neatsfoot oil should also be avoided as it can decay linen and your shoes are likely to be sewn together with linen thread. Fortunately vegetable oil and olive oil are both good to use and widely available. If you would prefer to buy waterproofing then I’ve had good results with Dubbin, although do read the label to make sure they haven’t added anything odd since I last used it. A word of warning: direct heat irreparably damages leather, so if you get soaked at a show don’t put your shoes on the firebox to dry. Home radiators or fires will have the same effect, so if you want dry them, just leave them to air dry in a warm, but not hot, place. A second word of warning: leather shoes will go mouldy if left damp for a prolonged period of time. Do not forget to unpack your shoes and leave them out to dry after a show! If you do accidentally leave your shoes in a plastic bag between September and May, only to retrieve a set of blue furry objects the night before the show, then you should soak them in clean (not soapy!) cold (not hot!) water and gently scrub off the mould. Leave them to dry then re-oil them as above. The reason you need to avoid warm water is because this will harden the leather, making it brittle and potentially shrinking the shoes. Much of my research is done by looking at historical finds and at illustrations. Finds are the ultimate physical evidence of past objects, but they are often in poor condition, or the context of the find makes it difficult to interpret in terms of who it belonged to, how common it was, or how it was used. Furthermore, as we rarely get the opportunity to view the actual object, it is easy to be misled as to its size. The above is a photo of the archaeological report for a sixteenth century Dortrecht find. The dark lines show the shape of the actual find. The dotted lines show the estimated shape. Can you guess what it is? It’s a fragment of a purse. In contrast, however, illustrations are good at showing us how objects were used and who was wearing them, but artistic licence, fashion, and the purpose of the illustration all mean that they are not necessarily a faithful representation of the physical object. The above image is a photo of the Bayeux Tapestry. Among other things, note the blue-legged horses, and the buildings only marginally bigger than the horses. Useful, but hardly a definitive representation of “how things were”. Over twenty years of re-enactment I have built up a rather large library of images of both types, both in books and through photocopies. When I say “large” I do mean that literally: it takes up a lot of space! Happily, this year I discovered Pinterest, which makes it far easier to store collections of images without requiring the purchase of an additional room to house them all. If you are interested in seeing some of the sources I use, you may like to follow me, in particular my fifteenth century and early medieval boards. It is, of course, no longer 2013 and therefore this post is very belated. I’m still here and still busy making historic replicas, but 2013 was a busy year which amongst other things included a house move, so sadly, blogging took a back seat. One of the highlights of 2013 was meeting and joining Sir John Savile’s Household. They are a lovely fifteenth century (Wars of the Roses) group and joining them has given me the perfect excuse to have a lot of fun making all those objects that we just don’t have evidence for earlier on. A new period of course means a whole new set of soft-kit (or in my case, re-making, since I have expanded slightly since I last made fifteenth century kit). All of the clothes shown in the photo below were researched and made by me personally over the course of a month. 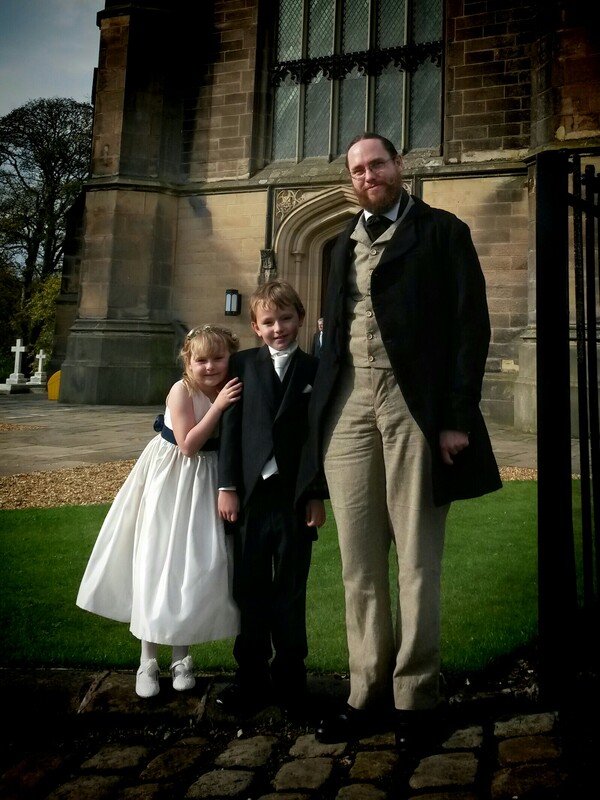 2013 also saw me making a Victorian gentleman’s suit to wear to my sister’s wedding, shown below. If you would like to commission soft-kit for any period, please do get in touch to discuss your requirements. I had a question from a reader about my post on seax and knife scabbards: why didn’t you talk about how they were painted? Short answer: because they weren’t. Do we have any finds of painted leather? Yes. We have finds of painted leather-covered shields from the Roman period onwards. Parchment is also made of leather and this was of course painted, both with ink when writing and for decoration. The twelfth century writer,Theophilus, mentions painted leather screens in “On Divers Arts” (a treatise on painting, glassmaking, and metalwork), and implies that they have been around a long time. In the later medieval period we also get finds of painted leather boxes. All of these items, however, are rigid objects with no flex in them. 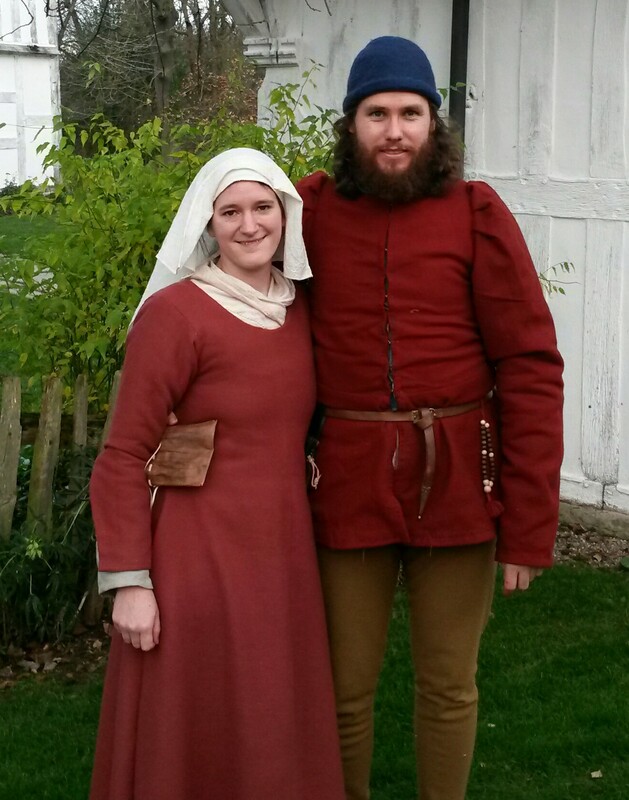 The only find we have of painted leather on clothing or personal items is a thirteenth century strap found in York. Crucially, this is found several layers above early medieval finds which do not show any evidence of painting, indicating that the reason we don’t find paint on other leather items isn’t simply because it hasn’t survived the ground conditions. Notably, this York find is painted in the recesses of the decoration rather than on the relief, probably because it was less likely to rub off there. Paint is likely to survive in the recesses if anywhere, yet we have elaborately decorated scabbards from the nineth century to the sixteenth century, from all over Britain, which don’t show any evidence of paint. All paint essentially consists of pigment to provide colour, plus some kind of glue to make the paint hold together and stick to objects. Until the Renaissance, the binder was made from e.g. milk, lime, or egg, all of which are inflexible when dry. If these paints were applied to a surface which bent or flexed, the paint would simply flake off. Paint was extremely expensive because all pigments except certain reds, yellows, whites and blacks had to be imported from outside Europe. Painting shoes, scabbards or bags was therefore an expensive way to throw away money. Even when oil paints are developed in the 13th/14th centuries, however, painting flexible items is not common. Painting leather has only really become common with the introduction of modern (acrylic, enamel) binders in the 19th and 20th centuries. Was leather in Britain coloured at all? Finds which come out of the ground certainly show a range of colours, mostly brown. Different tanning methods produce different colours of leather. What we now call vegetable tanning produces much paler leather than, for example, oak tanning, which produces very light to very dark brown. “White” leather is also mentioned as being used in high status gloves, although note that we don’t know what colour “white” leather actually was. This probably means a very pale leather, but the precise shade is unknown. 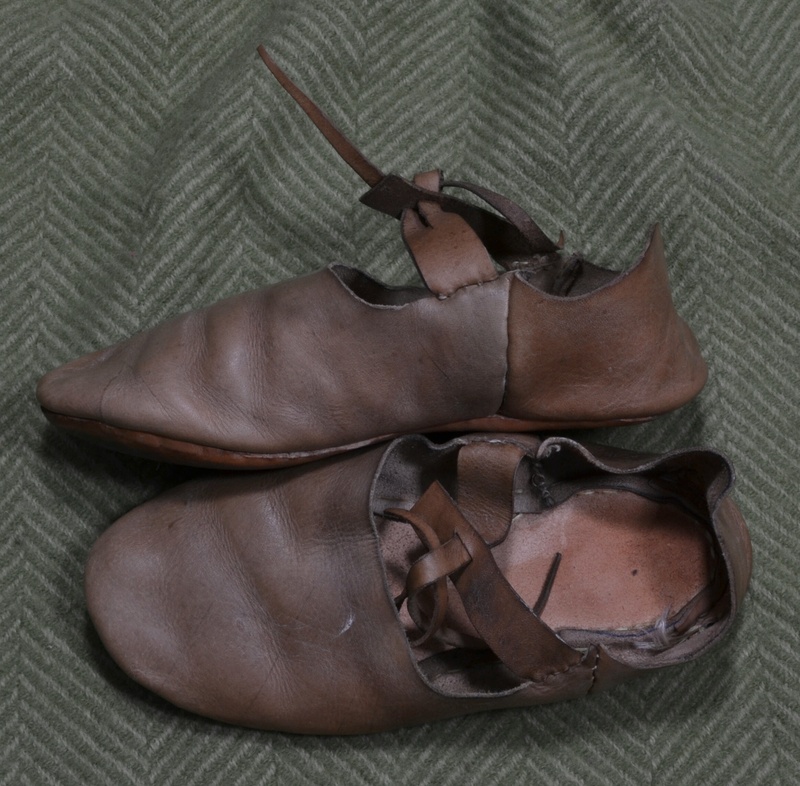 The uppers of the shoes above are veg-tanned, but have been dyed to resemble the colour obtained from oak-tanning. The orangey soles are actually oak tanned. It is also entirely possible that leather was dyed, since we have evidence of leather being dyed elsewhere in the world throughout the period, but to my knowledge none of the published research into British finds includes the necessary chemical testing to know for sure. Finally, some of the York finds show evidence of a border around the top of the shoes, sometimes from a different leather and sometimes just with the hair on the outside rather than the grain. After 1500 years in the ground, these pairs of shoes are pretty uniformly brown, but it possible that this is evidence of different coloured leathers being used for decorative effect. Comparatively little has been published on leather finds. Although you can learn a lot about which items were made from leather, how they were constructed, and what patterns they were decorated with just by looking at finds in museums, and although you can do experimental archaeology to find out e.g. what happens if you paint leather with period paints, detailed information about dyes, tanning methods and other treatments can only really come from chemical and microscopic analysis of the finds. If you know of any publications dealing with this or any research in progress, please let me know! From the earliest finds to the sixteenth century, knife scabbards are decorated. They are civilian items rather than wargear, expressing personal taste and fashion. Finds range from those clearly decorated by skilled craftsmen to the rather inexpert efforts of someone tarting it up at home in an attempt to keep up with Sven from next door’s new scabbard. Larger (7″ upwards) early medieval seaxes are suspended horizontally from two loops with the cutting edge facing upwards. The scabbard is “closed” (i.e. the two edges are joined) above that top edge. In Britain this is usually done by stitching and riveting, as shown on the right of the image below. Smaller seaxes hung vertically from a single loop and were frequently closed by stitching along the back of the blade, as shown on the left. Where the seax is top-closed, the top edge is usually riveted because stitching could be cut by the blade inside. Some of the York finds have washers below the rivets and interestingly, if the washer is made of a ferrous material then the rivet itself is non-ferrous and vice versa. Some Scandanavian finds have metal edges along the top closure, as shown below, but there is no evidence of this in any of the British finds. Post-Conquest, fashions change with the horizontal seax falling out of use and knives of all sizes hanging vertically with a back closure. In the early medieval period the underlying design for the decoration of seaxes follows a distinct form, dividing the scabbard into seven sections which are then decorated. The front of the scabbard is divided into four: the handle, the blade, the gap in between, and a top ridge, as shown below. Perhaps surprisingly since it would rarely be seen, the back of the scabbard is also decorated, albeit less elaborately. The back is divided into three sections: handle, blade, and gap. Smaller knives are consistently divided into handle and blade sections, but there is much greater variety in what else is decorated. Post-conquest the style starts to shift and the gap and ridge decoration are lost, leaving just the blade and the handle. This goes hand in hand with the change in how the the knife was worn: the handle is now the “top”. The two main British collections of early medieval finds are from York and from Dublin, and although they all follow the division into seven sections, the actual patterns embossed in those sections differ. 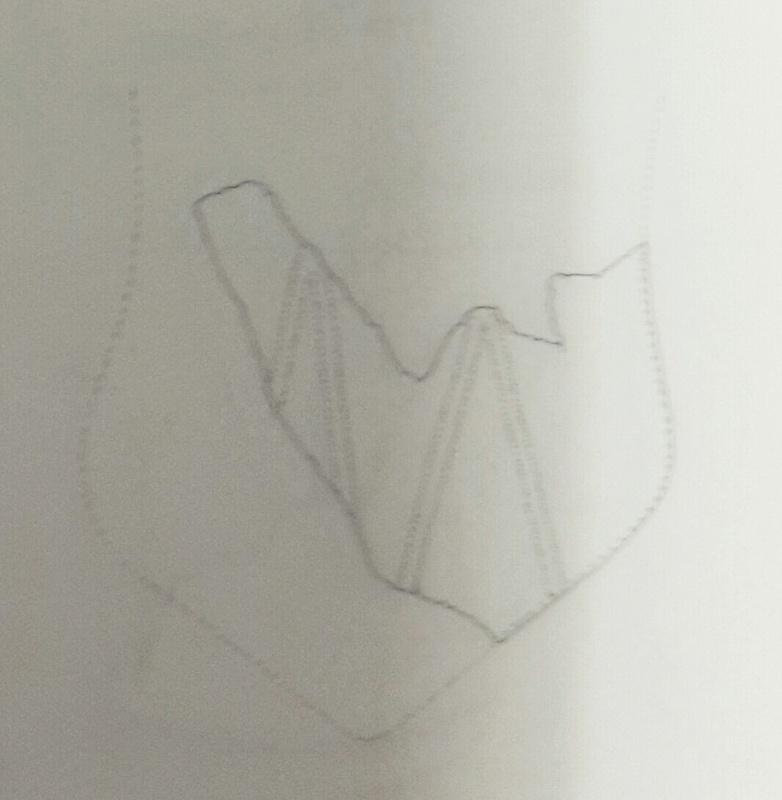 The Dublin finds tend to show mostly geometric patterns such as triangles, crescents and straight lines, as in the image below, whereas the York finds tend to show interlacing and knotwork. Note that neither style of decoration appears on wargear such as shields or sword scabbards: they are practical items which show no significant levels of personalisation. It is tempting to see the differing patterns as evidence of regional variation in fashion, but it isn’t certain that that’s the case. We know that there was extensive trade between York and Dublin and style and method of construction suggests that some of the Dublin scabbards came from the same workshop as one of the York ones, so there must have been substantial cultural exchange between the two. The differences may therefore come down to two different craftsmen’s styles, rather than regional variation. Geometric designs continue to be common until decorated knife scabbards go out of fashion, but we have very little evidence for zoomorphic and foliage patterns such as those shown below before the late tenth century. Once zoomorphic and foliage designs become more common, we can also see much greater variation in artistic fashion, if only because there are many more ways to draw a tree than a square. As a result artistic designs are often used to date later finds, although how reliable this is is left to the reader to decide. Early medieval leatherwork is all embossed, with stamping coming into regular use post-Conquest. These continue to be the primary methods of decorating leatherwork, because the more modern technique of engraving (i.e. cutting) can weaken the leather. Not only does embossing create relief, but also darkens the leather where it is compressed. Embossing is a very simple technique, which can be done by anyone of any age. It makes an easy activity for bored children on site, requiring few materials and limited potential for injury! The leather must be slightly damped, e.g. by rubbing a wet finger across it. Don’t spit on it or spill water on it as it will get too wet, and when wet it is easy to inadvertently tear or punch through the leather and weaken it. The design is then impressed into the leather using a blunt point. At home, a darning or knitting needle will do the job. On site, the tip of a bone pin should be pointy (yet blunt) enough. The goal is to press into the leather, not to scratch, cut, or puncture it. And that’s it! Happy embossing! 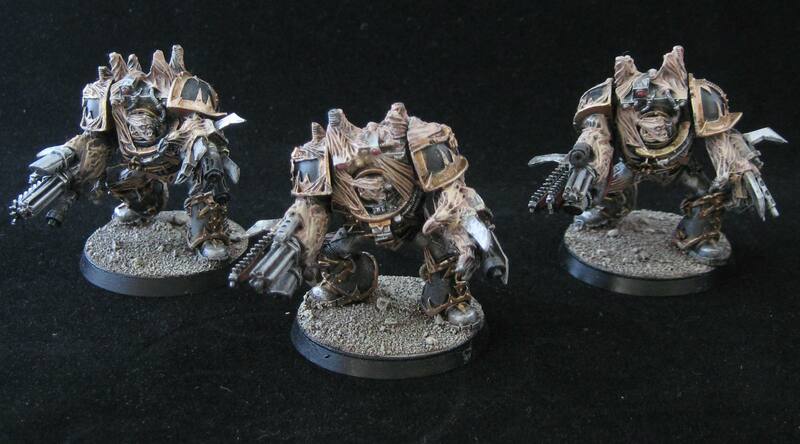 Painting models is easy compared to photographing them. 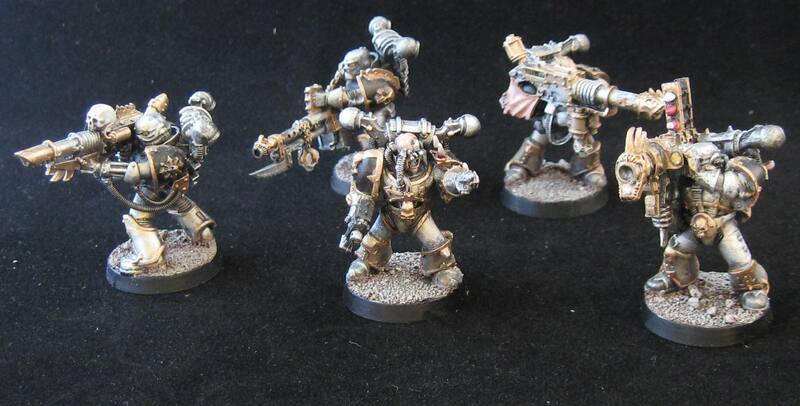 I finally got my hands on some new photographic equipment this week, so here’s the fruit of this week’s labours: photos of a 28mm scale Chaos Space Marine Army I’ve just finished painting.